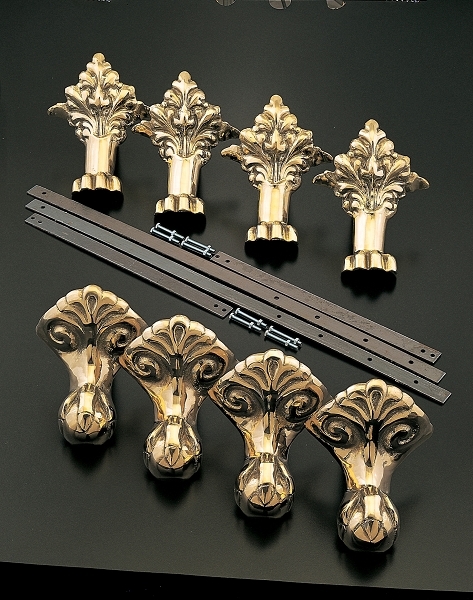 Elegant Solid Brass Clawfoot Tub Legs are sold in a set of 4, are 9 1/2-inch high, and fit tubs 6-inch from the floor. Tub legs have paws and beautiful design. These tub legs come with four steel straps (two long and two short) and nuts and bolts to form a cradle that will hold most leg tubs. Available in choice of Lacquered Brass, Chrome, Polished Nickel (shown in image), Matte Nickel, Oil Rubbed Bronze or Painted White Leg finishes.